Available is a broad line of standard and custom flexible, semi-rigid, and ultra-flex cable assemblies. Low loss, high performance cables, as well as ruggedized assemblies suitable for production environments are also available. Standard and custom flexible cable assemblies can be supplied using virtually all of the common RG Type Cables. The Cable Assembly Department manufactures semi-rigid and ultra-flex cable assemblies from user supplied sketches, prints, or bent samples to facilitate fast turnaround. Our semi-rigid cables utilize MIL-C-17 approved material with a soft OFHC copper outer jacket to allow the cable to be formed and re-formed after the connectors have been installed. Tin-plated or silver plated copper jackets, as well as aluminum jackets are also available. Ultra-flex is a hand-formed alternate to semi-rigid. It offers the same electrical characteristics as the corresponding semi-rigid, but the solid outer jacket is replaced with a copper-tin filled braid. This results in an extremely flexible assembly, which can be shaped and reshaped by hand without tooling. Both semi-rigid and ultra-flex cable assemblies are available in all standard diameters from .047” to .325”. 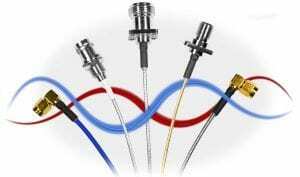 Other options is .085” and .141” diameter phase adjustable semi-rigid or ultra-flex cable assemblies, using the 3993 series of adjustable SMA male connectors. High performance cables include low loss designs for receiving systems, and high power low loss types for transmission applications. We also offer durable assemblies for use in challenging production test environments. They are available using all the appropriate connector series including N, BNC, TNC, SMA, 7/16, 7 mm, 3.5 mm, 2.9 mm and 2.4 mm consistent with the frequency of operation.